Remaining competitive with a small marketing team has always been a challenge. Developing and executing a comprehensive marketing strategy with a small team takes careful planning, creativity and streamlined strategies. If you, like many small businesses, are working with a stretched marketing team, then you know exactly what we are talking about. However, marketing automation technology is changing the game for these small teams which is allowing them to thrive and compete like never before. Hopefully, if you’re one of these small teams we are speaking about, you already have started experimenting with some forms of marketing automation. Whether you have setup basic autoresponders or are more advanced with programmed lead nurturing campaigns, it is more important than ever that your marketing automation efforts be paired with your CRM strategy. When you integrate your CRM and marketing automation together, the result is a well-executed campaign that delivers personalized content at specific touchpoints throughout your buyer’s journey. It is also idea for these small marketing teams as integrating the two will save you tons of time in the long-run. While this strategy might seem obvious, you need the right software to make it happen. When your marketing automation runs directly off your CRM, reserve your valuable resources, while also producing some superbly personalized and well-targeted campaigns. It doesn’t always take hundreds of thousands of dollars and a massive team to create truly great marketing happen. It takes access to accurate and up-to-date information collected in your CRM and properly set up marketing automation. It is this strategy which will propel your business efforts forward. 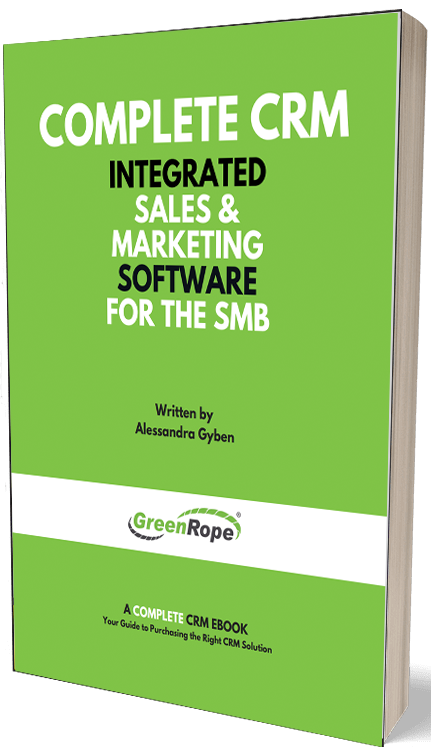 Here are three compelling reasons why integrated CRM and marketing automation is a win-win for your small marketing team. Good quality marketing automation isn't actually entirely automated. While your automation may send emails on a schedule and even intelligently choose which emails to send, there's still a lot of work to be done. Properly executed automation happens in multiple parts: creating the email templates, setting up your triggers, and personalizing your messages based on the data you’ve collected within the CRM. While each part takes time to get setup, once you’ve done the initial setup, your CRM and marketing automation platform does the rest. Gone are the days of strenuous and manual list building. When your marketing automation is paired with your CRM, data collected from different parts of your business is stored inside a single platform that will actually build your lists for you. This is called segmentation. Past customers, new leads, separating targets by demographic, behaviors, and detailed interests are easy to do when your marketing automation can filter through CRM data for you. This frees your marketing team up to do what they're really good at: designing compelling and personalizable email templates that the automated marketing software can use along with the CRM to and drive leads down your funnel. Key takeaway: CRM and marketing automation help you automatically segment your contacts, so you can spend less time building your marketing lists and more time actually building your marketing pieces. Traditional non-automated email personalization takes time...LOTS of time. While most automated marketing software can copy names from an email list in a fill-in-the-blank fashion, today's consumers require more in-depth personalization. It takes using comprehensive data sets stored within your CRM, such as their buying history, favorite colors, birthdays, and so on. Manual personalization takes too long, creating inefficiency within your organization. Not to mention, significantly increasing the chance of mistakes. With CRM and marketing automation tied together, you don't have to spend as much time personalizing. Your software should have the ability to use predefined data sets to automatically insert content specific to the recipient. For example, let’s say you segment your messages based on a contact’s role within a company. A complete CRM and marketing automation platform can use that information to personalize your messages based on their role, let’s say sales vs. marketing. That way, you are only creating one email with dynamic data. This is a huge time saver and makes sure that your contacts are getting the information relevant to their specific needs. Key takeaway: Save tons of time and avoid costly mistakes by allowing your marketing automation platform access to the robust data sets stored inside your CRM. Let your technology do the personalization for you! Finally, there are sales opportunities you don't even have to plan for. Lead qualification, for example, can happen any time day or night. Whether or not your sales and marketing teams are in the office to respond. Most modern businesses have one or more online lead qualification routes that automatically create an entry in the CRM when a lead gives their email address and shows interest in your services. With CRM-linked automated marketing, you are able to start your lead on a customer journey based on the information they give, their interest in your products/services, and so on. Then, you can attach additional automated processes, like workflows to help pass the lead off from marketing to sales. This seamless integration of the two departments help drive leads down your funnel and increases the chance of conversion. The contact experiences multiple touchpoints and the salesperson never misses an opportunity to close a new deal. On top of that, the sales person has a much better idea of where that contact is in the sales funnel. They will have access to view which emails the lead opened, website pages they visited and so on. This gives the sales team a much better view of their lead and whether they are qualified to purchase or move to the next stage in your sales funnel. Through the use of CRM and marketing automation, a small internal team can seem much larger, while also getting a lot more done on a daily basis. The consistency that these automated processes create, help teams deliver better customer experiences for all leads and clients. Key takeaway: Help your sales team qualify leads more quickly and drive leads down your sales funnel with integrated CRM and marketing automation. The marketing team can automate the qualification and lead nurturing process and only deliver the best leads to the sales team! Marketing with a small team doesn't have to mean falling behind the curve. With advanced automation software tied to your already-detailed CRM, many forms of personalized marketing can take care of themselves so your team can focus on what they do best. Designing more great marketing materials to automate with great software.